During the days when we get back from long trips or tours, we would always prefer to have harmless and simple home food. For example, feeding on something like milagu rasam and potato curry would feel like a five star lunch menu :) It happens because nothing on earth is equalant to home made food. Delicious to taste and easy to digest. 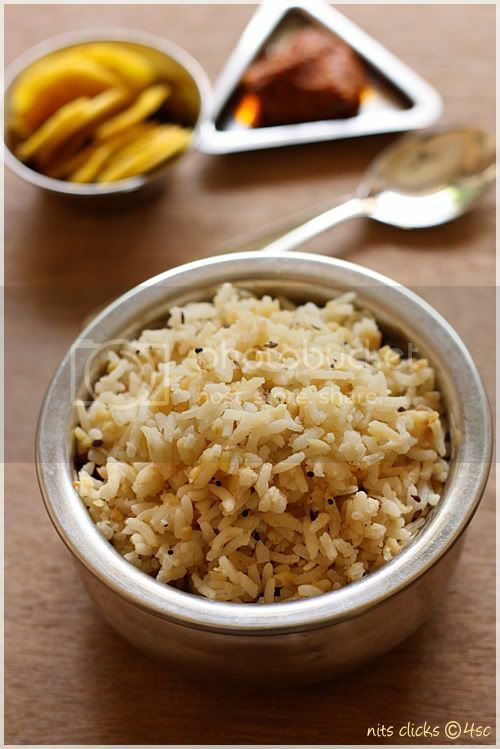 Dry roast the rice and moong dhall separately and collect it in a large bowl. Take 2 tsps of oil in a pan and temper with mustard, cumin seeds, red chillies and curry leaves. Add this to the rice and moong dhall mixture along with salt and scrapped coconut. Now pour in 3 cups of water and steam cook like rice. Approximately 3 whistles. Allow it to come to room temperature and then stir once before serving. Serve with banana chips or pickle of your choice. I ask my mom to prepare pongal this method only. Is this called Musiri? Nice to know. Just want to grab the bowl with the chips. Simple and super. beautiful recipe and amazing pictures to accompany :) its always a pleasure visiting ur blog! So simple and yummy...Love it! Yeah we too make but call as arisi Sunday, lovely clicks! New to me. Must try. Lovely clicks. New to me.. looks so inviting with chips.. This is new to me, but looks amazing with that pickle..
i had this once at my friend's place...loved it..thanx for sharing...amazing clicks Niti..superb recipe.. 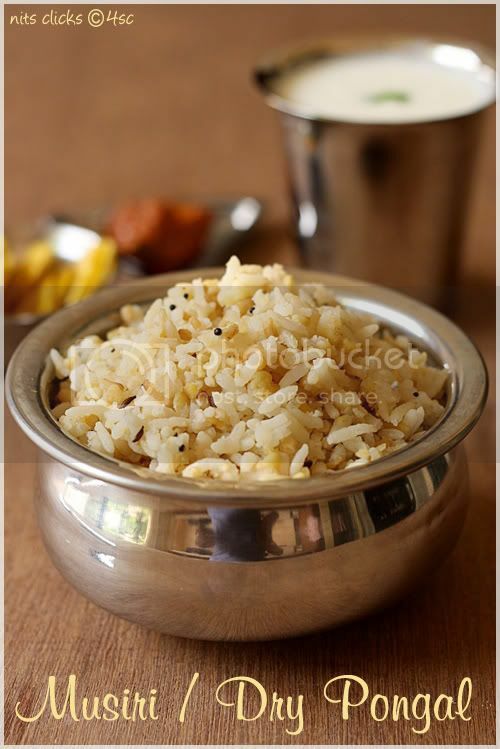 Simple and delicious rice. Nice clicks as always. Pongal looks super delicious . Very nice clicks. A simple comforting food, presented traditionally. What is that beside the rice in that tumbler?? Is it Mor?? omg! 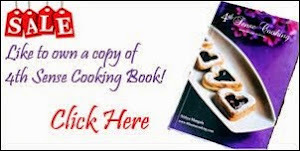 awesome recipe...and u rock with ur clicks! Had this very long back,love this version...luks delicious. this really new to me....looks very yummy n want to try it...gud pics nithi! I add ginger too... tht gives a lovely aroma of it!! We call this sojji and generally they will be served with milagai podi but I love them with sugar and milagai podi :-) Yum!! My childhood favorite food. Haven't made them for a long time as my husband doesn't like it. I can see you on the spoon and on the last snap.. :) Really I love this pongal a lot. Thanks for sharing. Rasam and Keerai are our fav comfort food to come back home to after going any where!! Don't believe I have heard the name musiri before, bit the pongal and the pot look wow! very new to me but would love to give a try. Great clicks. Wow.. This is how my mom makes pongal...yum.. I've not eaten this before but it looks delicious. 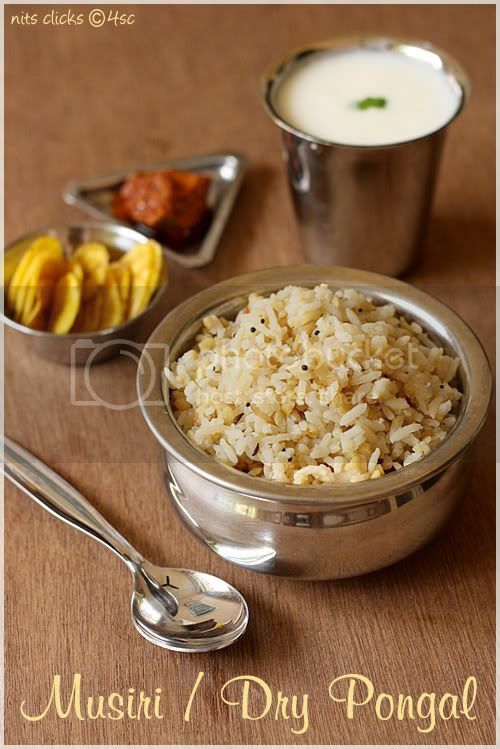 Ahhh..yummyy pongal..and very nice clicks!! Nits loved the platter, looks so yummy..those chips and pickle are so perfect! 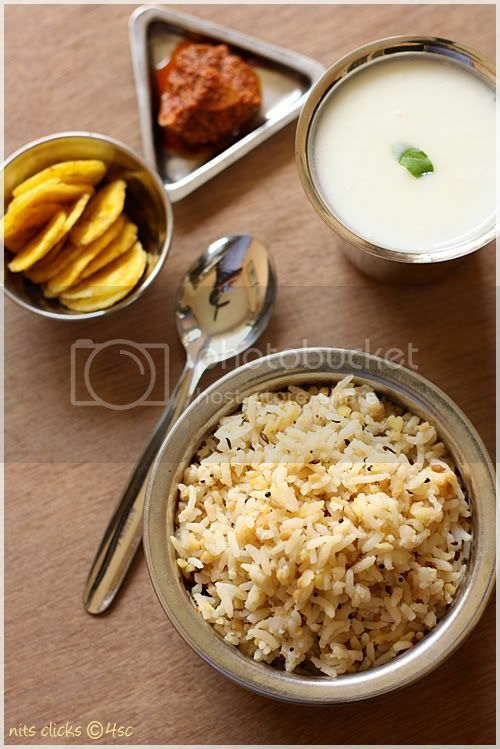 Wow..yum..yum..love this pongal and the clicks too!